Just a few pictures of a pretty simple refinish I did for a client recently. 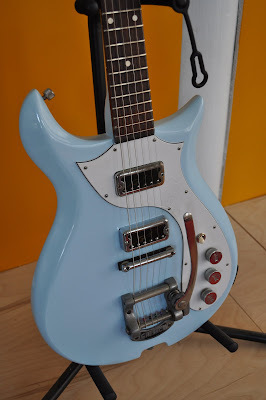 He had a late-60s Gretsch Corvette, which had suffered the usual corrosive pickguard disintegration that these guitars are prone to - and had also been stripped and refinished sometime in the past, though not very well. 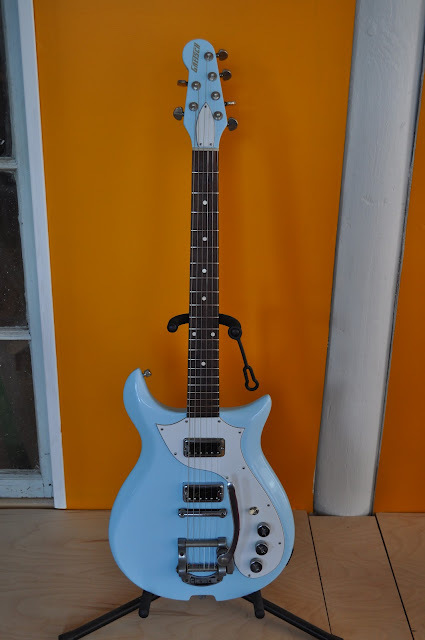 He had stripped the guitar and had a custom white/black/white pickguard and truss-rod cover cut for it - and asked me to refinish the guitar in Daphne Blue. 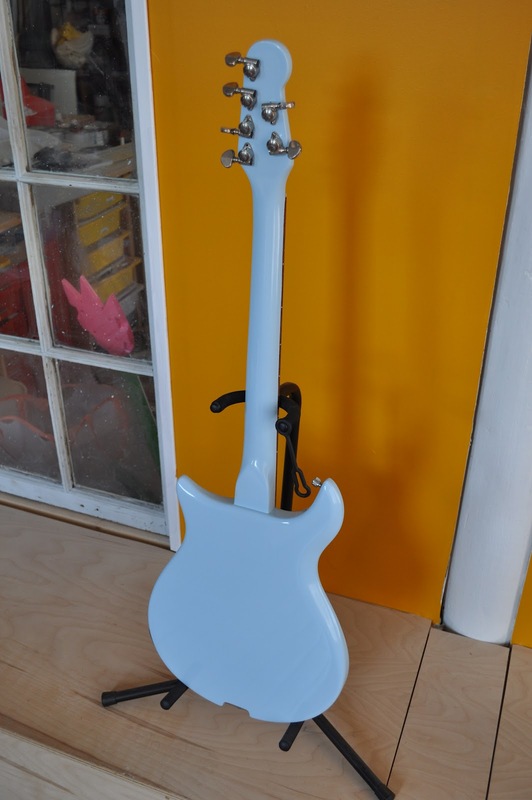 After looking at a few paint samples and completed guitars, he realized he actually wanted to lighter and greyer Sonic Blue. We did discuss the non-originality of the refinish he wanted, but he was not excited by the prospect of a stock cherry red or black/red burst finish - and really wanted to duplicate the color scheme of a 60's Fender guitar. 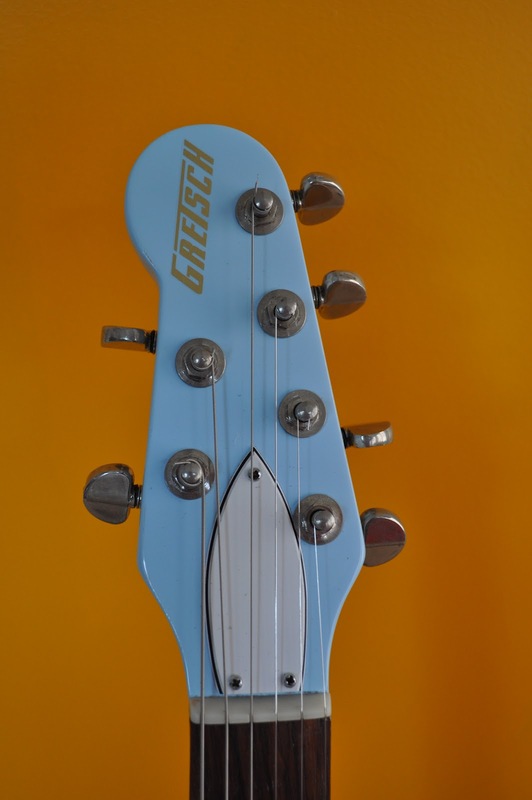 In keeping with this aesthetic, we also decided to paint the face of the headstock a matching sonic blue, instead of black as would have been stock on a Corvette. 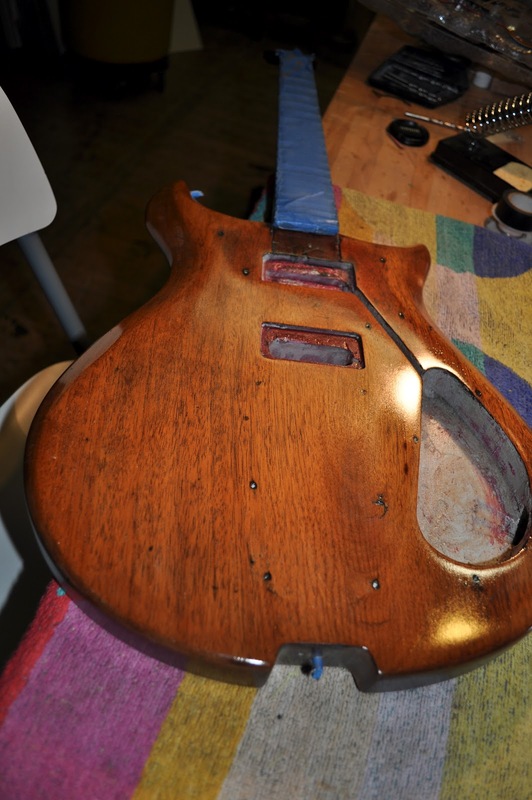 I started by sanding and then sealing the mahogany body and neck - and then applying many coats of sanding sealer, so that the grain of the wood would be completely sealed by the underlying clear coat. I used a dark grain-filler too - as would have been used on a cherry finish originally. By doing this - I allowed for future stripping of the guitar without white primer or Sonic Blue colorcoat getting into the open grained mahogany - just in case someone wants to restore it to it's original finish some day. As you can see - this guitar was made of some nicely grained mahogany. 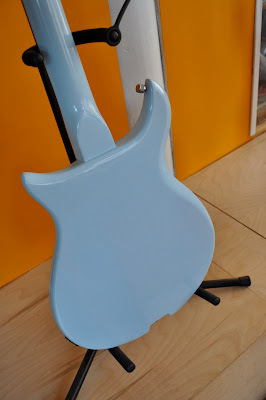 Applying the Sonic Blue finish over the clear finish was pretty easy, since the surface was well prepped. I only had to do two coats of Sonic Blue, followed by three clear gloss coats. After about two weeks of curing - I wet sanded and buffed out the body and returned it to the owner. He re-assembled and installed the guitar hardware (the Grover's are not original - this guitar would have had Van Ghent tuners like a Hagstrom) - and then brought it by for me to install a repro Gretsch logo (which I had been waiting for). The gold lettering was a perfect little detail to top off a very pretty guitar !! It takes experience to restore such classic. Did you use a primer? If so, what color was it? Hi Jake - I did use primer - a flat white lacquer primer. The mahogany was first sprayed with a clear nitro clear coat, then the grain was filled - followed by a few more clear coats to fill the pores in the mahogany. After that, the white primer was applied - I think it was two coats, with wet sanding of each coat.